In 2005, the Alberta Genealogical Society, Edmonton Branch endorsed a proposal to produce a comprehensive, all-name index to the microfilmed Alberta homestead records in the possession of the Provincial Archives of Alberta (PAA), accession number GR1974.048. Members of the Edmonton Branch volunteered many years to create this index making information on Alberta land settlement accessible to everyone. 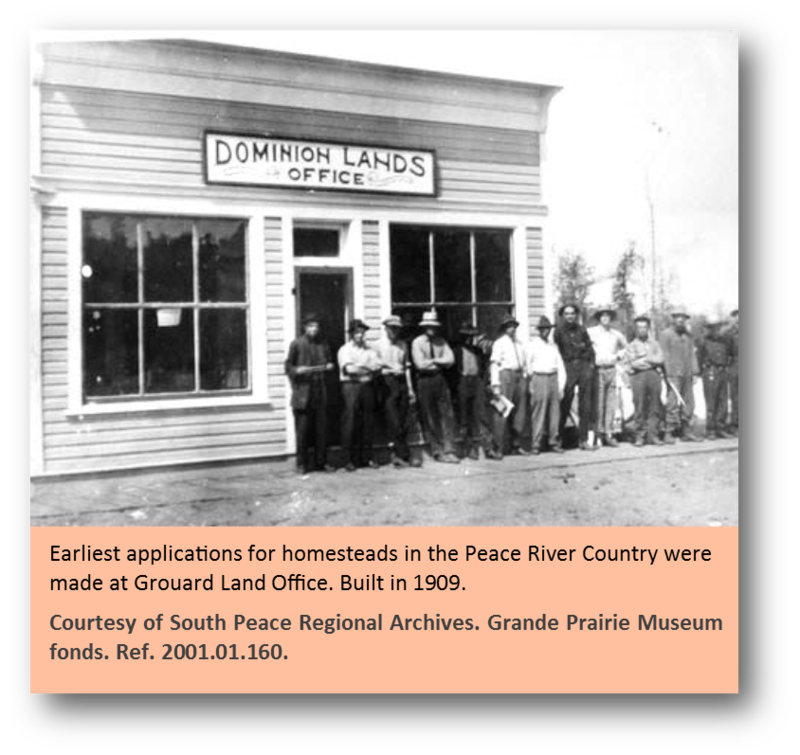 Prior to 1930, records of land settlement in Alberta were handled by the Dominion Lands Branch of the Federal Government. Control of natural resources was transferred in 1930 and all active land files were turned over to the Province. These files were then re-numbered into a series designation using the prefixes GL (General Lands, mainly homesteads), SL (School Lands) and GR (Grazing Leases, mainly ranches). After 1954, files were organized by land description and the series designation discontinued (Land Description). Documents in these files may date from early 1900 to late 1950s. Files were stamped closed, stored and then microfilmed during the 1950s and 1960s as sections of land were disposed of, patented, or sold. The microfilms in this collection were deposited at the Provincial Archives of Alberta in 1974; accession number GR1974.048. Most original files were destroyed. The files in this collection may contain homestead applications, sale of land documents, lease agreements, as well as many other documents, such as inspector's reports, records of abandonment, handwritten letters, wills, naturalization certificates, scrip, seed grain liens, court proceedings, etc. Researching this period of homestead files, for family history purposes can be very rewarding. These files pertain mainly to homesteading activity in Alberta and were active Dominion Land Branch files when transferred by the Federal Government to the Alberta Provincial Government in 1930. The files were renumbered into the provincial "GL" series and transaction documentation added after 1930. Closed files were microfilmed 1939‒1954, (1183 microfilm reels). Most original files were destroyed. Sections 11 and 29 of each township were set aside and disposed of to finance school construction and purchase of school supplies. The files in this collection document the disposal of these lands and were created by the School Lands Branch, Department of Interior and still active in 1930 when transferred to the Alberta Provincial Government. The Branch Registry used its own file numbering system and case files were prefixed with the letters "SL" (280 microfilm reels). The files in this collection were created by the Dominion Lands Branch, Department of Interior, and were still active in 1930 when transferred to the Alberta Provincial Government. The collection documents the granting of ranching leases, and all case files were prefixed with the letters "GR". Documentation of land transactions occurring after 1930 was added to the files by the Alberta Provincial Government. Closed files were microfilmed in the 1950's (307 microfilm reels). All series distinctions in land transactions were abandoned about 1954. After this date files were organized by legal land description rather than purpose. The files were microfilmed between 1960‒1970, (567 microfilm reels). Most original files were destroyed. The index includes organizations extracted from the records. To search for these, include any of the following in the surname field: Cemetery, Churches, Company, Municipality, Ranch, School District, Organization, and Society. Although every effort has been made to achieve information accuracy, there may be errors due to legibility, variations in spelling of surnames, recording of file numbers, etc. If, in your research, you discover a mistake, please let the Alberta Genealogical Society know and it will be corrected. Names often appeared only once in a file making transcription difficult. Use the Advanced Search facility on the search screen to find spelling variations. Please note that spelling variations in given names and surnames within a file have been listed as separate records in data.